A few weeks ago I took my family to explore Monte Camino, an integral location for Allied forces during the Second World War. Not only were we bowled over by the beautiful 360 degree views but we also had a special encounter with a local family, giving us a new understanding of the landscape and ways of life. You can find full walk directions and a map here. The walk starts from the tiny village of Camino, just above the hill town of Rocco d’Evandro. 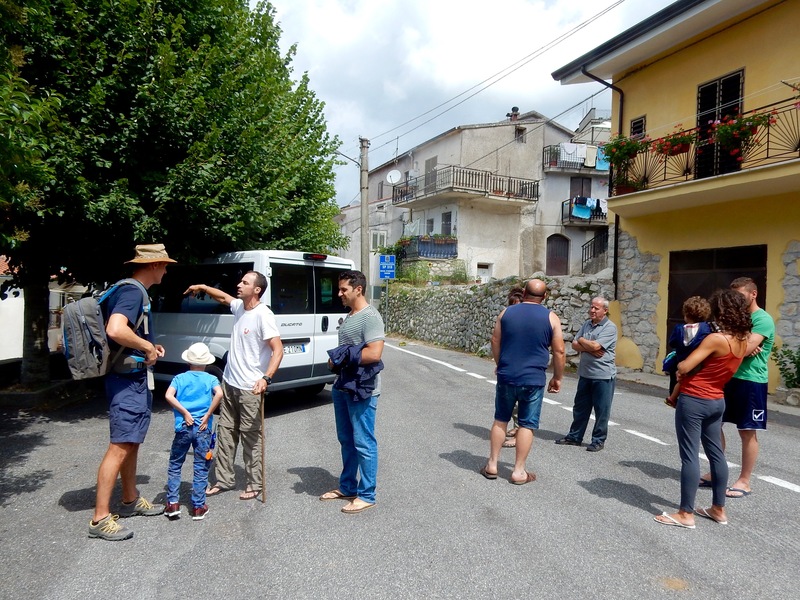 I’d heard it had just 15 permanent residents, but the village square was positively humming as we filled our backpacks. A woman came up to us speaking French, which completely confused us and there were several minibuses with people coming and going. 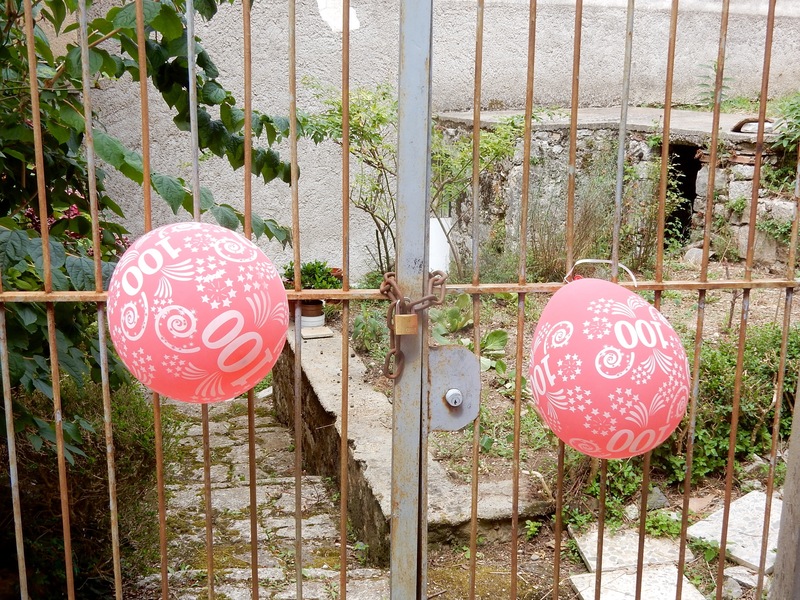 It turned out that Camino’s eldest resident, Rosa, had just celebrated her 100th birthday and relatives had flown in from around the world. Bright pink balloons adorned every post and even the Madonna had pink ribbons tied around her. We high-fived various great-grandsons and quietly left the celebrations behind, setting off up a steep, narrow street which slowly dissolved into an ancient forest track in dappled sunshine. Along one side ran a pretty limestone stone wall decorated with pastel lichens. There’s something about these ancient ways that appeals to me; the fact they’ve stood the test of time but also a feeling of solidarity with the boots that have marched before. I paused and ran my hand along the bark on a handmade wooden gate and admired its simple, rustic beauty; together with a nearby oak tree it framed a gorgeous view of the valley below. The trail lead us to another tiny hamlet, Colle, where we found a handful of tumbledown houses and an old stone wash tub, milky with suds. Beside the road orchards were bursting with late summer fruit – plums, peaches figs and grapes. There were scrawny chickens pecking in the dust and heinz 57 variety dogs and cats sprawling listlessly in the shade. Beside us, the hedges were laden with blackberries and we made delightfully slow progress as the boys took one step forward and one sideways to eat them, hands and mouths splattered with purple juice. At this point there were no signs to the chapel or Monte Camino and the map I’d sketched at home was proving…wishful thinking! Luckily, a shepherd jogged past and showed us the way, dissolving tensions. For the next hour we listened to him calling his goats and the sound of their bells tinkled sweetly up the valley. Lizards and butterflies danced at our feet and gradually, the trail became much steeper and drier, forming a tight zig zag through the pines before opening up to reveal the chapel above. At the top, we found three generations of the D’ettorre family having lunch. There was a battered jeep with a green trailer on the back and a group of men were leaning on the railings for a smoke. Several women were perched around a little camp table handing out bread, meat, cheese and an array of home-grown vegetable dishes. Kids were running in and out of the chapel and being affectionately reprimanded. The group cheered and clapped as we walked up the last hairpin bend and then, without hesitating, invited us to join in. Boxes that had been packed away were re-opened with generous smiles and drinks handed round. To one side, a fire was smouldering and I could smell herb scented meat. A daughter, Stefania, spoke good English, helping us all to translate. As we relaxed and shared our stories, a warm camaraderie emerged – neither party could quite believe the other was there and we were all curious to learn more. Earlier in the day a storm had rumbled as we trekked up the lower slopes and I was a disheartened because the sky remained grey, threatening to rain and giving a flat light for photos. But as I sat at the table and dipped my bread into some sweet melanzane (aubergine and tomatoes), my back grew warm and the sun came out from behind vast white clouds. The landscape lit up and all of us were enthralled, even Stefania’s father Giovanni, who was born in Camino and has known the area for over 70 years. He told us tales of his childhood in these hills and how Monte Camino was a vital point on the Gustav line in the Second World War. In fact, you can see the famous Monte Cassino not far away to the north, where Allied soldiers mounted a daring assault to reclaim it from the Germans. Giovanni’s parents helped both German and Allied soldiers with food and places to hide, and at one time his mother and brother were held for 3 days in the castle. Although his father tried to help using old hunting guns, he never knew quite who was shooting who and grew terribly depressed. Over 1500 men were lost on Monte Camino alone. Giovanni and his friends found fallen soldiers many times during their childhood and stole what they could, guns and buttons being the biggest prizes. With no trace of irony he went on to describe 42 years in the police, patrolling the region on foot and horse, then by bike and finally car. He took my husband’s arm and walked away up the track to talk about his current passion, his garden; how each item we were eating was grown and harvested, about the rhythms of the land and the patience and love you have to show. Tears flowed freely as he remembered the day he lost his wife when she was still young, that he was the only man he knew that could cook, that Stefania began raising her brothers when she was just ten years old. I let them talk man to man and stole away for a few moments to walk around the chapel and soak up the views, which stretch as far as Naples and Vesuvius in the south and almost as far as Rome in the north. Clouds made shadows on the land and it was as if central Italy was a perfect jigsaw laid out before me. There was a ragged outcrop below the chapel and it dropped steeply to rolling valleys and hills, some with circular villages perched on top. To the west, the ancient volcano of Roccamonfina and the Aurunci mountains stood out in bright technicolour; bookends at either side of a swathe of rich, green farmland that follows the Garigliano river to the coast. Looking the other way, I could see the spine of Monte Cesima looming above the A1 motorway, with a hydroelectric dam glinting on top and beyond this, the tips of the Matese mountains. It was absolutely spectacular. Meanwhile, the nonnas and zitas (grandmas and aunts) joked with our little blonde boys, sat them on their laps, caressed their cheeks and gave them biscuits whenever I turned my back. We let the afternoon slip away chatting and eating, eschewing time. Suddenly, Giovanni jumped up and invited the boys to ring the chapel bell with him. A thick white rope hung down and it took him four or five pulls before the great bell rang out across the countryside – we’d heard it earlier and thought it was to celebrate a special Saint, but in fact, it was just Giovanni letting the world know he was there! Then he took us to the ridge behind the Chapel to see ancient stone ruins. He pointed out important places and gently pulled up handfulls of wild thyme, mint and sloes. At the foot of Monte Camino we could see Rocca d’Evandro’s 10th century castle and pristine medieval ‘centro storico’ (old town). Before we knew it Stefania had called a friend to see if she would open up the exhibition for a private view. Sadly the friend was away but the sentiment meant a lot. After exchanging email addresses we said a heartfelt goodbye and set off back to Camino down a much easier track. The clouds were turning purple and there were cracks of thunder in the distance, so we hurried. Before long Stefania ran after us, sent by her father to make sure we were ok and insisting we get a lift to outrun the storm. A moment later there was a great rattling and peels of laughter – and the jeep and trailer bounced down the track with the rest of the family crammed in, legs dangling over the sides, baskets and kids balanced on top. Every time I follow my heart and head out into the countryside and into the unknown, I am rewarded – with incredible hiking and views yes – but often with help, food, stories and camaraderie too. I am naturally curious, it’s why I walk; I literally feel compelled to explore the landscape around me and when I meet people, I always want to know more. So meeting the D’ettorre family was very special – like someone had opened the lid on a treasure box – gifting rich insights into the opinions and ideas of the people who live and work this land, to their ways of life and traditions and what matters to them today. Yes, we are different, but this lunch celebrated our similarities and the values at the heart of Italian culture – food, family and friendship (and always in that order! ).